Rev Dr Graham Buxton is an ordained Anglican with extensive pastoral experience in both the UK and Australia. Prior to ordination, he was a lay pastor in an Anglican church in the north of England, following earlier careers as a marketing executive in the oil industry, and a lecturer in a university business school. He emigrated to Australia in 1991 with his wife and three children to take up a teaching position at Tabor Adelaide, where he was instrumental in developing the postgraduate program at the School of Ministry, Theology and Culture. He is now Director of Research Development, and also serves as the Director of the Graeme Clark Research Institute, an initiative established at the college to conduct, facilitate and promote research and development in the broad context of Christian service to the community. He teaches in the areas of practical theology, pastoral ministry and the science-theology interface. Graham is a Visiting Fellow at St John’s College, Durham University in the UK, a Fellow of ISCAST (Institute for the Study of Christianity in an Age of Science and Technology and has taught as an adjunct professor at Fuller Theological Seminary in California, USA. Graham teaches: God the Trinity. 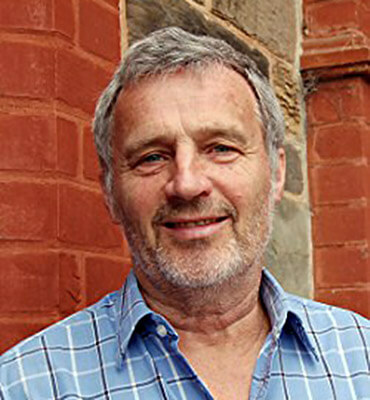 Graham’s research interests are focused on (1) practical theology; (2) an understanding of Christian ministry within the framework of trinitarian theology; (3) the relationship between the science-theology dialogue and Christian pastoral ministry; (4) incarnational and contextual ministry; (5) the sacred-secular divide; and (6) the theology of Jürgen Moltmann. (Forthcoming) An Uncertain Certainty: Snapshots in a Journey from ‘Either-or’ to ‘Both-and’ in Christian Ministry. Eugene OR: Wipf & Stock, 2014. G Buxton, C Mulherin & M Worthing, God and Science in Classroom and Pulpit. Mosaic Press, Melbourne, 2012. Celebrating Life: Beyond the Sacred-Secular Divide. Milton Keynes: Paternoster, 2007. The Trinity, Creation and Pastoral Ministry: Imaging the Perichoretic God. Milton Keynes: Paternoster, 2005. Dancing in the Dark: The Privilege of Participating in the Ministry of Christ. Carlisle UK: Paternoster, 2001. ‘Moltmann on creation’ in Sung Wook Chung (ed. ), Jürgen Moltmann and Evangelical Theology: A Critical Engagement, Wipf & Stock (Pickwick Publications), Eugene OR., 2012.